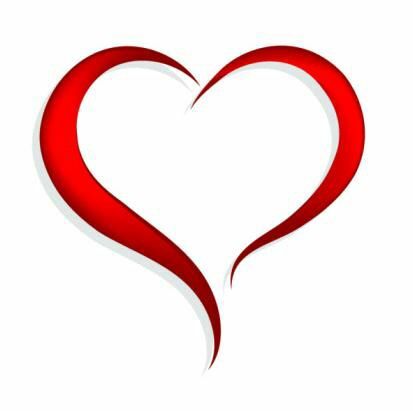 Welcome to the January Pinterest Challenge Blog Hop, hosted by Erlene @My Pinterventures. The purpose of this Pinterest Challenge is to motivate all the participants of this hop (and you, too) to not just pin, but to make it happen! 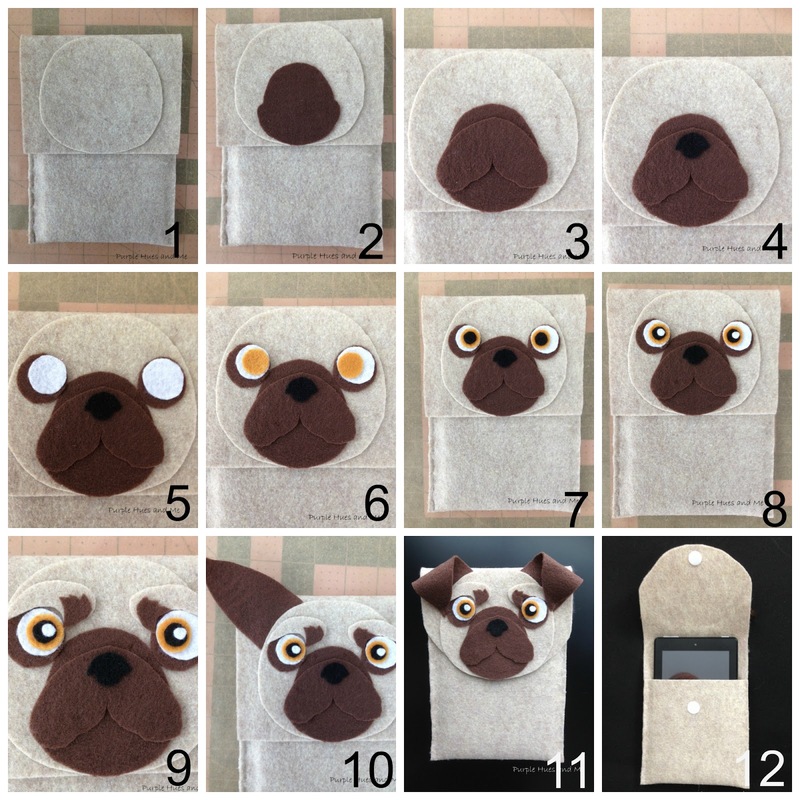 This month, I chose to create a No Sew Felt Pug Tablet Cover! You've probably seen the animal shape covers for iphones and tablets done in felt on Pinterest! I think these are so adorable! There are lots of different kinds of doggies and I especially like the pugs. My dearest best friend loved pugs and raised a few before she passed. Every time I see anything related to pugs I think of her and I miss her everyday! The thing about these pins is that there are lots of images, especially from Etsy, and a few false links on Pinterest, but not one step by step tutorial. Don't you just hate it when the links take you to sites completely unrelated! The following pin illustration was the closest to a tutorial that I could find. And it's just pictures of the different parts used - all in a foreign language. Here's my version of this pug tablet cover! I really had to adjust the sizes of the pieces and do a bit of tweaking for my Amazon Fire tablet size. Let's begin by measuring the width and height of the Amazon Fire tablet and then add one inch to the width (4 1/2" + 1") for seam allowance on the 18"x12" felt. If you have an iphone or ipad, etc. you can adjust your measurements and resize the pieces to make the cover that suits you. Then cut out the felt to measure 18" x 5 1/2"
Next, make a pocket for the tablet . . .
adjusting the flap where the pug head will go. Run a bead of Fabri-Tac fabric glue along the pocket seams and clamp in place until dry. Next, using the pinterest patterns, copy to word to adjust the sizes (I had to lengthen the ears to fold over) and then cut out. 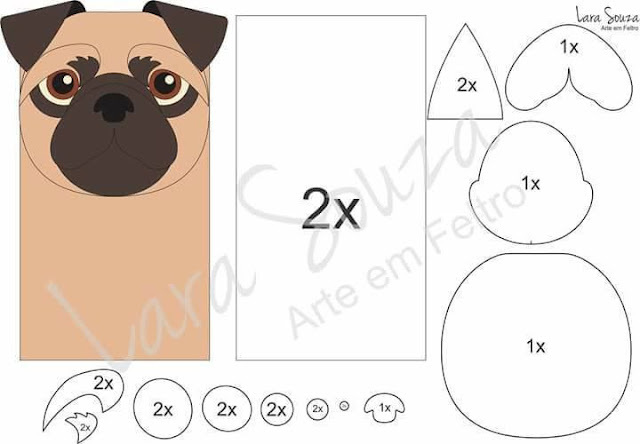 Next, cut out all the pug pieces in felt using the image as a guide for colors to assemble the head. 1. Glue on the head. 2. Next glue on the muzzle. 8. And then the white dots for glare. This is for you, Sandra! Love you always! So very cute! Your hands are never idle and produce such an array of fun things! Hope you didn’t get too much snow this past weekend! It is very beautiful! I will do it, sure! !Thanks for share! My dear Gail, this is absolutely adorable! And I love that it's a no-sew project :) Hugs to you! What a cutie! I love this idea to keep your tablet in. You are so clever to take an idea and adapt it to just what you need! Thanks for the great instructions on how to make this cute table cover. That's adorable.. I may have to try adapting this for a Pokémon character! My middle son carried his kindle with him everywhere and just loves Pokémon. The pug made me smile though; my grandmother had a put that used to go everywhere with us. Once he passed away she collected all sorts of pug stuffed animals, little statues, and even pillows with their faces on them. Pinned. That became quite a project - it’s always tricky when you can only find the photo and not a real tutorial. But now you have made it possible for others to make this. I just love pugs! What a cute project! I have several friends who are pug lovers - pinning to make these as gifts! How adorable this little pug is. This is a very good tutorial Pinned. This is the cutest tablet cover ever! The doggy face is a just adorable! Awwwwww Gail, that is just soooooooo adorable and what a wonderful tutorial too. One of my friends is a complete pug-lio-manic (that's what she calls herself :-) ). I have got to try make this for her. This is too adorable!!! My older son would like this design, he wanted a pug puppy but we ended up getting an Australian Cattle Dog mix. I hate those dead end pins on Pinterest, too. Thanks for posting the one you used. This made me think of my son! He's obsessed with pugs & insists he will own one named Noodle one day, haha! He doesn't have a tablet but I think I could maybe use this for something else. Pinned! AHHHH!! I've just bookmarked this DIY as I love it sooooo much!!! Thanks for sharing on "Sweet Inspiration"! I too hate it when I click on a pin and it is irrelevant. So frustrating. Your step-by-step tutorial is amazing, especially for someone like me who needs the visuals with the instructions. This guy is super cute and can think of a couple of family members who would love this. Gail this is soooo cute! The pug face is adorable on a tablet cover. BTW - your facebook link at the top is broken.